Even you errant Ewok-haters should prepare yourselves to assume the mouth-agape-and-drooling position. It was 12″ tall, and “all cake” from head to toe. Heather detailed it with buttercream and crafted the facial features and hood out of chocolate fondant. 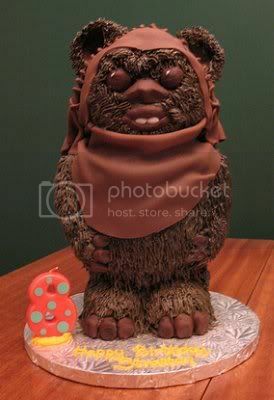 She created the cake for the 8th birthday of her best friend’s son, an enthusiastic Ewok fan. Since my big bro imbedded Star Wars in my brain at a young age, it wasn’t too hard to construct this cake with the help of a printed photo of an Ewok collectible statue. Lucky you! All I gave my little brother was a nervous tick. All you need to know about Heather is that she is a prolific cake-making hobbyist who one day hopes to turn her talent into a business. Oh, and she lives in the United States, Planet Earth, Milky Way Galaxy. Other than that, she prefers to remain anonymous, much like a ninja trained at a French school for pastry chefs. She spots the deserving victim, lays down a deadly cake-tastic attack, then melts away into the night. Ok, so she’s more like the Santa Claus of Confection, but I’m sure you can see how I was tempted to avoid using Kris Kringle in my ill-fashioned metaphor. There’s only room for one magical demi-god on this here geek blog, and that is Señor J. H. Christo. By the way, just so we’re clear: I’m a fan of the Ewoks. The command center of an AT-ST walker being crushed by two colliding, suspended logs in the Endor forrest? Best. Thing. Ever. Thanks to Heather for sharing the pictures and the deets. Keep up the good, ninja-like, cake-making work! I cannot deny this is a great cake (and it is actually a cake this time, right? ), but a FAN of the Ewoks? As in, Ewoks are the bees knees and always have been, or as in Jar Jar was so terribly awful that now the Ewoks don’t seem quite to obnoxious?? Wow. Not only a great likeness, but this has to be the tastiest-looking geek cake you’ve featured so far. I want to nibble on his little ears. I missed Wicket I really loved The Ewoks when I was a small boy. 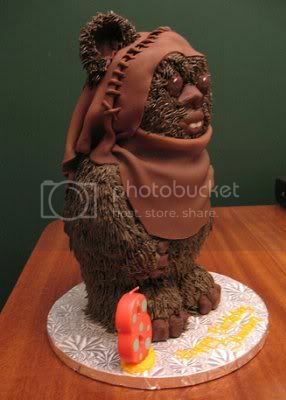 Bake me an ewok cake! 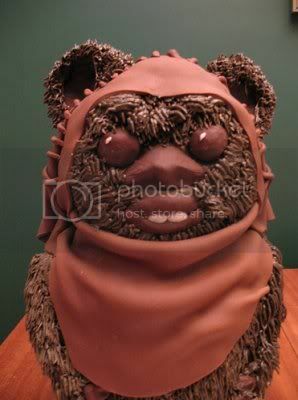 I HAVE A PET EWOK CALLED CAKE! HOW PERCULIAR! Next post: Reader Poll – How do you feel about Guillermo del Toro directing The Hobbit?